Favorite spot for James Bond, the name Monte-Carlo is known around the world as a center of glamor and high-stakes gambling. Formerly known as Les Spelugues, the site of Monaco's casino was re-named Monte Carlo in 1863. It's now the most famous district in the tiny principality, and the first place visitors go. The Casino of Monte-Carlo, on the Place du Casino, is an ornate Beaux Arts building designed in part by Charles Garnier, architect of the Palais Garnier Opera in Paris. On the sea side, the building is the Grand Théâtre , home to the Opéra de Monte-Carlo. Once inside, you have a choice of games: low stakes slots and poker machines, or high stakes tables with maximum bids of 30,000€ or more. The even more exclusive private rooms require an additional fee and the ability to ante up significant sums. Profits from the casino are the ruling Grimaldi family's—and Monaco's—prime source of income, as the principality levies no income tax. 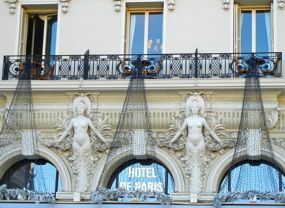 You may choose instead to enjoy the Place du Casino, with its beautiful fountains and Jardins du Casino, or to admire the architecture of the 5-star, 182-room Hôtel de Paris, on the southwest side of the place, or the famed Café de Paris on the northeast side. 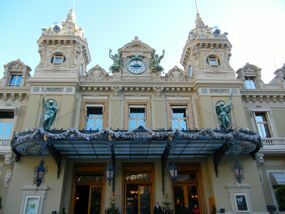 The southeast façade of the Casino building is the Grand Théâtre, home of the Opéra de Monte-Carlo. Monte-Carlo also boasts chi chi shops and many private banks focused on wealth management. Above, Casino of Monte-Carlo, Monaco.